We are looking for insights and experiences from worship leaders for our new worship leader book! If you are (or have been) a worship leader, please fill out the form below to submit entries to be considered for this book. Simply select the worship topics you would like to write about and provide your book content in the space provided below. By doing so, you may be included in this book! But hurry, because we will only be accepting book entries for a limited time. Thanks in advance for sharing your worship experiences with us! How do YOU define “Worship”? Do you have an original quote about worship? What is your favorite worship scripture/passage and why? What encouraging words do you have for other worship leaders? What challenges have you faced as a worship leader? What mistakes have you (or others) made while leading worship? Do you have any personal examples of great relationships with pastors or co-workers? Do you have any personal examples of challenging relationships with pastors or co-workers? What would you like pastors to know about leading worship and worship leaders? What would you like church members to know about leading worship and worship leaders? How has your worship ministry impacted your church? Do you have examples of people going beyond the call of duty within your worship team? Do you have any true worship stories that are “hard to believe”? How has God answered prayers within your worship ministry? Describe a bad practice experience you had that later turned into a great worship service. What bizarre technical difficulties have you experienced? Do you have any true worship stories that are simply funny to share? What scenarios have you experienced where team members have thought too highly of themselves? How has God moved in a clear and powerful way in your worship ministry? Have you had any “unique worship team members” (and their uniqueness)? What interesting “accidents” have occurred during worship practices or services? Have you experienced any interesting miscommunications during worship? What have you learned most about leading worship? 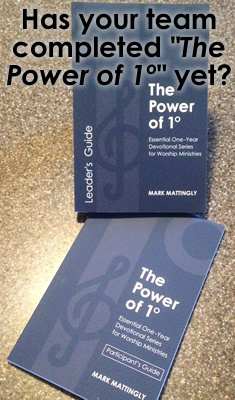 What other worship topics would you recommend for this book? Please keep me informed on the status of the book and entries.